A woodworker should always take into consideration the need to have the best power tools in his collection. However, with the availability of options out there, choosing the best one can be daunting. This is particularly true if it is your first time to purchase one. Circular saws offer precision and a unique cutting style compared to traditional saws. To help you with your purchasing decision, we have come up with this review and guide for you. We hope that you find this helpful. As a passionate beginner in woodworking, I found the need to have the right tools at hand. I started my hobby a few years back, reading through tutorials to complete a certain task, rather than finding somebody else to do the job. While regular saws can do most of the jobs, there is a certain level of precision that is offered by circular saws. Had I added a circular saw early on, I could have saved a lot of time in completing certain cutting tasks. Since most of the models are power tools, I could have also saved on energy and effort. It seems that a circular saw is equipped with features that are designed to accomplish intricate cutting jobs. The DEWALT DC390B circular saw model is a professional-grade circular saw that offers cordless portability and convenience without unnecessarily compromising features. This compact designed saw is equipped with a carbide-tipped saw blade, as well as a blade wrench. This is highly convenient for woodworkers who need to complete a task at a location where there are no readily available power plugs. As a bare tool, you need to purchase a separate battery and charger for this model. It is also recommended to have an extra battery pack when working in order support continuous operation. As a model under a very reputable brand, Black & Decker, you will surely expect nothing but quality with the BDCCS20B model. It is equipped with a high torque motor capacity at 5-1/2 inch, thanks to its fast cutting blade, allowing you to create different types of cuts. It also features a tool-free cutting depth, which makes it possible for easier depth adjustments. With its compact design, you can expect ease of use using this model. This item is also sold as a bare tool, which means that you need to separately purchase its battery and charger, though they are readily available because this model is compatible with entire Black & Decker 20v max system. The Makita 5007F 7-1/4-Inch Circular Sawis an affordable professional-grade circular saw which is found in most workshops all over the country. This saw comes with a set of features that offers exceptional performance. For one, power is the main feature of this model. While it is quite small, it performs similarly to other more powerful models. With its powerful 14 Amp inductive motor, this circular saw can offer a constant flow of torque which will not stall or choke on anything. As such, it can be used on any types of materials. Any woodworker or carpenter should consider getting a circular saw. This is one of the professional tools that one should include in his worker’s arsenal. However, it is not just ideal for professional or experts in the field. As a matter of fact, if you are an occasional DIY-er, a circular saw can prove to be a good partner in your tasks. These circular saws are designed for various purposes, and to cater to different users with different experience and backgrounds. There are models that are designed with portability and convenience in mind, while there are others that are built for professional grade, heavy duty use. Regardless of the type that you need, you can be assured that there is a model that will meet your needs and your preferences. In case you have not known yet, there are several types of circular saws that are currently available on the market these days. Therefore, it is not just about looking for certain features that you need to look into. In fact, it is important to identify the type of circular saw that would fit your actual needs and preferences. The motor is located just in the line of the blade. This means that it can deliver enough power to carve up even wet lumber or easily saw thick materials such as concrete. As such, this type of saw is ideal for major framing or renovation jobs. The handle is situated farther back, which means that you can resist a kickback better, as you steer it through longer rips. Most worm drive models have their blades on the left side, which is very convenient for users that are right handed. A sidewinder type of circular saw has the motor sitting alongside the blade. As such, it is lighter, and better maneuverable when used for a longer period, compared to a worm drive. They are considered as the typical competition of worm drive models. The main difference, though, is that the blades are located on the right side, which may pose some viewing issues to some. A trim saw is ideal for paneling or finishing work. They blades are smaller compared to other full-sized options that work on more intricate tasks. Some woodworkers prefer these types of smaller trim saws because they are controllable. Most models of circular saws are cordless. However, there are also ones that are built with convenience and portability in mind – the cordless saws. They are battery driven, which is ideal for those who need to work on something where there is no available electricity. They usually have limited operating times, generating less torque compared to their corded counterparts. Experts usually give a fair warning that regardless of how much you take care of your saw while working, there will always be instances wherein you might drop it unintentionally. Therefore, selecting the shoe style of the saw is a good thing to consider. Shoes that are made of cast metal, especially those that come with raised reinforcing ribs on the upper surface, will not bend compared to flat aluminum shoes the moment it gets in contact with the ground. Smooth cornered, bigger lever locks, as well as full-round knobs, may be tightened accordingly using the entire hand. The cutting depth and bevel settings are easier and faster to change with these models compared to hard-to-grasp and smaller wing nuts and levers. In general, being the power tools that they are, circular saws are dangerous to handle. Therefore, it is best to look for models that are equipped with safety features that help in protecting you as a user. One such feature is the electric brake, which prevents unnecessarily hurting your fingers the moment the trigger is released. The DEWALT DC390B circular saw is a cordless model. It is ideal for both commercial and domestic use. It is categorized under the professional level bracket and is often described as a high-performance industrial tool. Still, it does not mean that it is only designed for professionals because even beginners find it easy to use. Among the things that you can expect out of this model is the fact that it operates using common 18-Volt DEWALT batteries. This is advantageous to you if you already have one. The diameter of the blade is the standard size of 6-1/2 inch which can be availed of easily. This saw can also be tilted at any angle between the range of 0 and 50 degrees. This model can easily cut through 2-by timber, with a cutting depth of 2-1/4 (90 degrees), and 1-5/8 inch cutting depth (45 degrees). It is also one of the lightweight options out there, with a weight of only 6.3 pounds. This model can cut through all 2x dimensional lumber. Its carbide tipped blade can give you that cutting capacity at both 45 and 90 degrees, with a 0-50 degree bevel capacity which can give you additional capacity for different types of applications. This saw is equipped with a high strength magnesium shoe, as well as an upper guard which further promotes durability. It is also equipped with a fan-cooled motor that comes equipped with replaceable brushes that offer maximum durability and power. It is also being complemented by the use of a vibration dampening rubber grip handle, which makes bigger jobs comfortable to handle. The description of this product says that it is a ‘bare tool.' This means that it does not come equipped with a battery or a charger upon purchase. However, the good news is that it is running with the standard DEWALT 18-volt battery pack and charger which is easily accessible. This saw has plenty of power and torque. Designed with a left-mounted blade, which makes cutting easier to see. May be limited in run time. There is no blade lock feature. The BDCCS20B from Black & Decker is a 20-volt circular saw which is one of the commonly purchased models in Amazon. It is also referred to as a high-end option, considering that it is a product that is manufactured by a well-reputed brand in this industry. This model can be categorized in the mid-level regarding price. This circular saw model is designed with a built-in powerful high torque for a motor. It features a tool-free cutting depth as well as a very easy to use bevel adjustment capacity which enables the creation of accurately angled cuts. With its 5-1/2 inch blade, you can expect fast and smooth cutting, which is ideal for every day, tough jobs. This circular saw model is designed with a very compact and innovative style. As such, it is very easy to control, use and operate. It is efficient in both tight places, as well as when working with bigger projects. Similar with other mini-models of circular saws, this model offers enough power to deal with the tasks at hand. It has a high torque motor at 310-inch pounds, providing you swift cutting experience and enough power for the task. 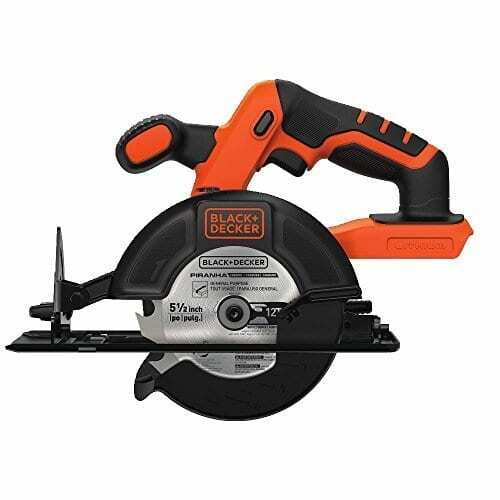 This model from Black & Decker is equipped with a 5-1/2 inch quick cutting blade. Its motor can reach up to 3,700 RPM without any need for a load. As such, you can expect the sharpest and smoothest cutting experience, despite being a mini circular saw model. This model comes equipped with a beveling feature which you can easily adjust its cutting capacity at both 45 and 90 degrees. This tool is very easy to operate. The components of this model make it lightweight. This is equipped with a perfect grip and design. The guide slots can be challenging to see. Whether you are a beginner or a professional DIYer who is looking for a solid power tool, the Bosch CS5 is a model that is worth your attention and consideration. It is often described as a reliable tool because of its performance and reliability. It stands out from the rest of the competition because of its high-end power, quality, and design. This model can provide 15 amps of power to its blade, allowing it to reach a top speed of 6,200 RPM, which can be considered as one of the fastest out there. The blade of this saw is designed to be located on the left-hand side, which allows you to have an unobstructed, clear view of the cutting line. Also, a corded model, you do not need to worry about electrical disruption. At the same time, this tool easily diverts sawdust far away from the cutting line, thus infusing an extra visibility layer. You may need to be careful, however, since the direction in which the sawdust are blown are towards you rather than going away from you. This may need some time to get used to, but not a huge problem about the model. This model is equipped with 15 amp motor power, offering a top speed of 6,200 RPM. This speed is considered as one of the fastest, if not the fastest, in the market. It can cut through 2x plywood or material easily and smoothly. The fact that the blade is located on the left side means that it offers good visibility. However, just a note, this may take some getting used to because you can also anticipate that the balance will be different from the common right-blade models. This difference in balance is quite noticeable when dealing with smaller and 2x material. This model comes with security features that make this circular saw a very practical option to purchase. It enables you to create a bevel and regular cuts without the need to advance the guard. Another security feature that this model offers is an enhanced spindle lock. This enables you to change blades easily making sure that the new blades are locked in place safely. High-end design, power, and quality. Equipped with the fastest spinning blade. The dust chute blows the dust towards the direction of the user. 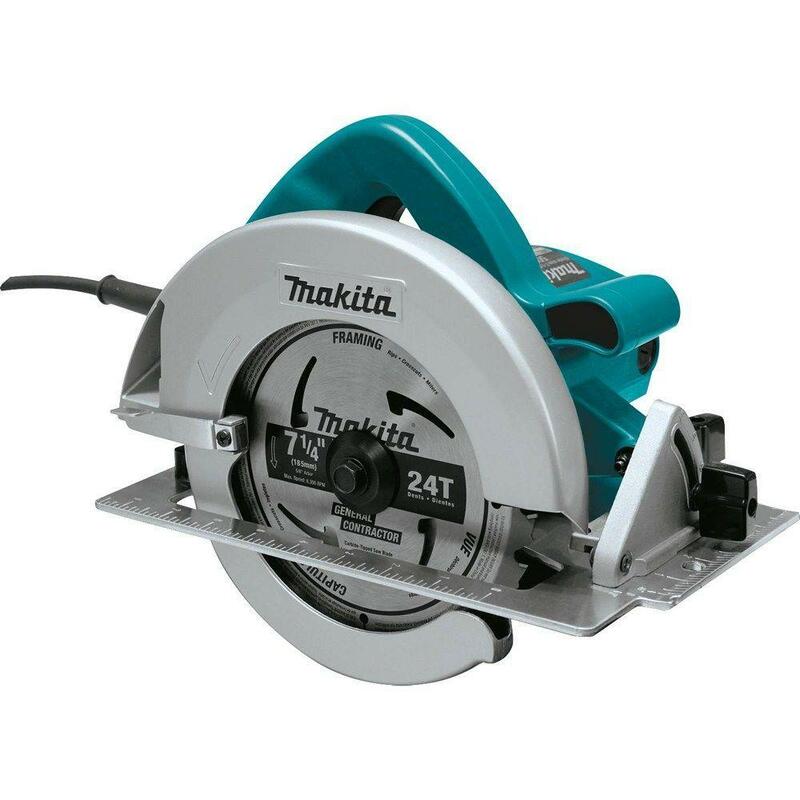 The Makita 5007F circular saw model is ideal for those who need a solid tool that can be used for occasional use. For example, if you want a dependable equipment that can help you with some repairs, this is a good option to consider. One of the well-praised features of this model is the use of Light Emitting Diode (LED) lights. This will serve as a guide to those who may be dealing with precision. This unit is also lightweight, and not as bulky compared to other similar models out there. Still, it is durable enough to perform certain jobs. The features incorporated in this model are modest and streamlined, allowing users to experience direction and precision while completing cutting tasks. You don’t even have to worry if you are a beginner as it is easy to use. This model comes with an incorporated dust blower. This can significantly help you become more effective while working on tasks, especially since dust can get in the way. As you saw, the surface is left clean and free from dust particles. This circular saw also uses an AC/DC switch. This will allow you to be efficient in using the power source since you can easily use whichever type depending on the useful and accessible current type. When using this circular saw, you do not have to worry about achieving accuracy when working on narrow and bevel cuts. The lower guard design of this model offers an effective solution to this issue, thus allowing you to complete your cuts cleanly and precisely. This model comes with a huge cutting capacity. Equipped with a well-balanced design for maximum performance and handling. It comes with a lower guard design that improves accuracy in cuts. Comes with a built-in dust blower. May not be effective for longer term use. This circular saw from Porter-Cable is light, in comparison to its other siblings under the same manufacturer. It is a portable and convenient tool of choice as it weighs 6.5 pounds only. This tool is well-balanced with its design. With the use of over molded rubber grips, the handle is very comfortable to the feel. 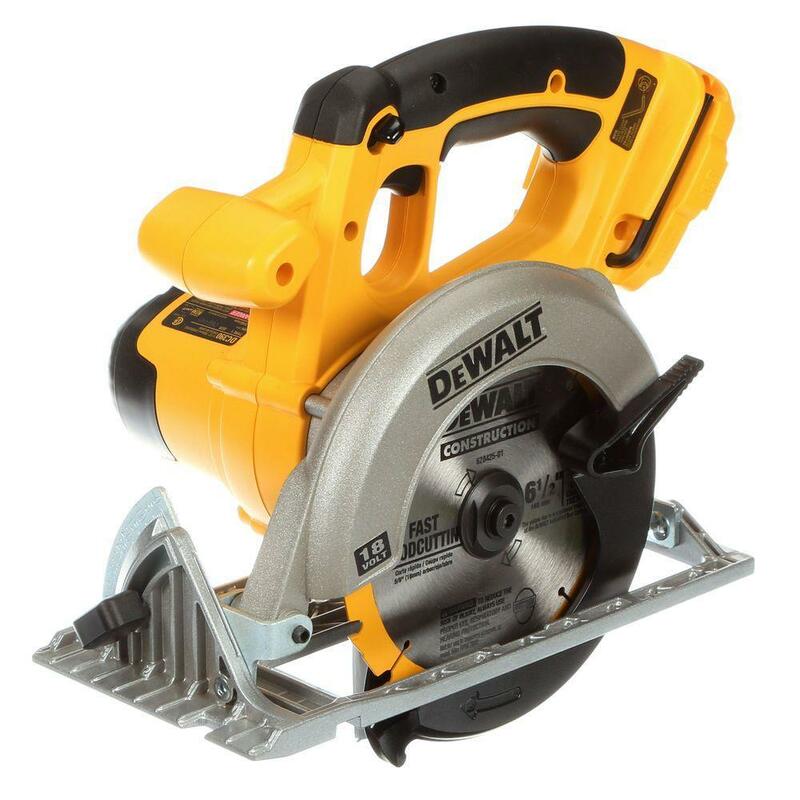 This 6-1/2 inch circular saw model is categorized under the light duty options. However, with its 50-degree bevel, 4.0ah battery, as well as 4,000 RMP top, saw speed, this model is still comparable when it comes to delivering performance, similar to other heavier models of saws. This circular saw model runs with a 20v battery. This means that it can deliver more torque and power. As such, you can expect not to deal with potential bog downs while cutting, and it will not overheat when working on plywood and other 2x materials. This product has been tested and proven as built with durability and dependability. The finish and fit of the product are smooth, without any sharp edges. The quality of the build is both sturdy and nice, which may not be something that you expect out of a lightweight tool. While it may come with some plastic parts, they do not feel flimsy or cheap. The housing, bevel set, and depth are all made of plastic, but they are quality made. The grips and weight of this circular saw model make it a very comfortable option to consider. As a cordless model, it is not a burden to transport around. With the use of a rubber contoured handle, fatigue and vibration are reduced. It is also designed to operate very quietly. This tool is lightweight and compact. Designed to deal with aggressive cutting. Increased user comfort with its over-molded handle. Most of the reviews are positive. One customer mentioned that because of this tool; life has become “so much easier.” He is a beginner with using cordless tools, but he likes this saw very much because the blade is easy to see, and cuts smoothly. Another customer also said that this is a “great tool.” He is not a carpenter, but a homeowner, doing a lot of minor repair and remodeling tasks around his house. This circular saw is a replacement of a previous model that he has. He liked it very much. First, it is lighter than his previous tool. The blade is bigger enough as well, efficiently cutting through 2x material stock. Some have also sent in their suggestions to the manufacturer. For example, one customer mentioned that he felt that the plastic blade guard is not effective enough regarding durability. This plastic part of the product made him feel that this DEWALT product is not at par with the rest which was professional grade. If you are searching for a professional-grade circular saw, the DEWALT DWS535 is a good option to take into consideration. This power tool is equipped with several features that can make different types of cutting tasks easier. This saw delivers a 15 amp motor power, running at a top speed of 4,800 RPM with no load conditions. It uses roller bearings and self-lubricating ball, allowing for more efficiency as a tool. It also comes with an adjustment which enables you to set the angle of the blade between 0 and 53 degrees, thus offering flexibility while performing cuts. The SKILSAW SPT77WML-01 is a model that is backed up with the reputation of a pioneer in this industry – SKIL. This company is known to manufacture durable and powerful tools, including this model. This model is driven by a worm drive engine, which means that it offers a powerful motor capacity and professional quality. Dialing and fine tuning of this model are quite easy. It comes equipped with an on-board wrench while creating those adjustments are also easy. As a professional grade tool, it is one that is usually preferred by construction workmen who needs a tool that can perform heavy duty tasks. The WX429L model is compact in design, serving as a great choice for individuals who are looking for a lightweight and convenient option in a tool. This tool is well praised because of its easy adjustment and accuracy regarding cutting depth. It also features an easy-set depth gauge, allowing cutting angle adjustment up to 45 degrees. It is an ideal option if you are searching for an affordable and compact saw which can complete smaller jobs within your home. The use of a vacuum port is an additional feature that minimizes mess when you are working in an indoor environment. This Milwaukee 2630-20 circular saw model is a durable and cordless option that is also backed up by the reputation of its manufacturer. It has been designed to offer lightweight and powerful cutting, ideal for the different type of users. It utilizes magnesium guards, both upper and lower, making it longer lasting as it offers protection to the blade against drops. It also comes with several other standout features that make it adaptable and easy to operate. For example, it comes with an ergonomic handle which is also designed to offer amazing balance and comfort, while allowing easy controlled cuts. Overall, this saw is suitable for different types of carpentry tasks. The Makita XSS02Z circular saw model is designed to operate harder and longer compared to other models. The bevel duties of this model are run by a heavy-gauge, all-metal shoe that can be set easily to a maximum of 50 degrees. On top of the performance features offered by this model, it is also designed with comfort in mind. For example, it is equipped with rubber-coated grips both in the front and the back. Another feature that makes this a good option is the use of LED work light, as well as a dust blower. Because of these features, visibility of the cutting line is clearer. With all of these features combined, this saw is ideal for professional workers how need power and portability in a potent, small package. The Ryobi P506 model is equipped with features that make it another standout option for a power circular saw. For example, it is equipped with an exact line laser which activates automatically while in use. It also cuts using its 5-1/2 inch carbide tipped blade, which also ensures an extended life of the blade. Among its security features are a spindle lock as well as an on-board wrench storage which makes it possible for easy and quick blade changes. With its compact design, this saw is built for better handling and performance. It also runs with a powerful high output motor which makes it very effective for demanding tasks and applications. This Bosch CSW41 circular saw model is a worm drive type of saw. This means that it is lighter compared to other models out there. The foot and motor housing are constructed using magnesium, rather than using the usual steel or aluminum materials. It also offers a bevel gauge range of 0 to 53 degrees. The cutting depth is also marked accordingly, allowing for better visibility. The wrench of the blade is also nestled comfortably into the foot just beneath the rear handle. This handle is made of plastic, highlighting a soft-grip rubber over a mold. The trigger tension with this saw may be heavier compared to others, but it is very convenient to use. As a sidewinder saw, the PORTER-CABLE PC15TCSM model comes equipped with a 15 amp motor, spinning a top speed of 5,600 RPM. It also comes with a sharp blade, giving you enough power to cut through sheets easily. It is comparably lighter compared to other options, as it uses mainly magnesium, aluminum, and plastic. The primary handle is covered using a rubber over the mold and is huge enough to be held comfortably, even when you are wearing work gloves. The locking knobs of this model work well and are very fast and easy to adjust. It also comes with an integrated dust blower which is effective in keeping dust away from the cutting line. The EVOSAW180HD circular saw model runs with 15 amp motor capacity, reaching a top speed of 3,900 RPM. It is praised for its capacity to cut mild steel clean minus the need to deal with coolant, burrs, and heat. It is highly durable and robust, perfect for various cutting tasks. With its advanced performance, it can outperform standard cutting saws. When working with steel, it leaves a workable finish instantly. With its bevel adjustment capacity between 0 and 45 degrees, it is versatile enough to deal with various jobs. Other standout features of this model are the use of a safety switch as well as an auto-debris collection feature, collecting chips along the way. The R3205 circular saw model from Ridgid Tool may be considered as one of the heaviest options out there, but it is not noticeable because it offers an even balance on its motor. As a sidewinder saw, the blade is located on the right side of the tool, which means that it is very easy to maneuver and control. Another feature of this model is the use of a dust chute design, which removes dust away from the tool. It also has a spindle lock design which secures the blade right into the drive shaft in just a press of a button. As such, blade replacement is effortless. All in all, finding a good circular saw that could help you with your different types, whether as a professional woodworker, or a DIYer becomes less of a challenge when you are aware of your options. The options above should give you a good idea of the potential options out there. We hope that through this guide, you now have a better grasp of a well-informed decision. A high-quality circular saw does not have to be very pricey. As seen in the options provided, there are those that are very affordable, without unnecessarily sacrificing the quality of the features. Look for one that will not just meet your needs, but even your personal preferences too.